I really liked the abstract shapes created by the ditch in the foreground and the big bush in the mid ground. I knew I'd paint this some day! I celebrated the first day of summer by getting out and painting outdoors. I didn't get out until the afternoon and it was a bit windy and quite warm but I decided I had to take the paint outside, it's been too long. 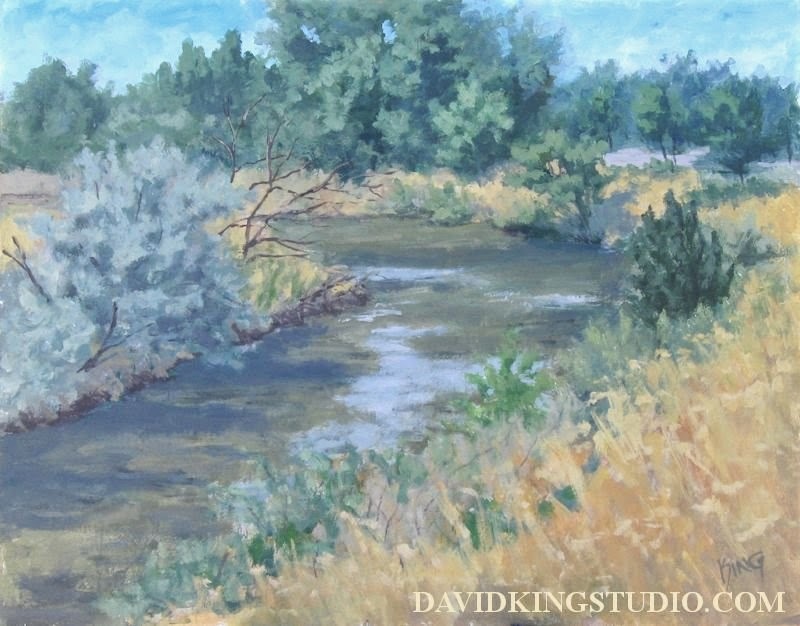 I visited one of my favorite areas on the Jordan River Parkway and painted the river. 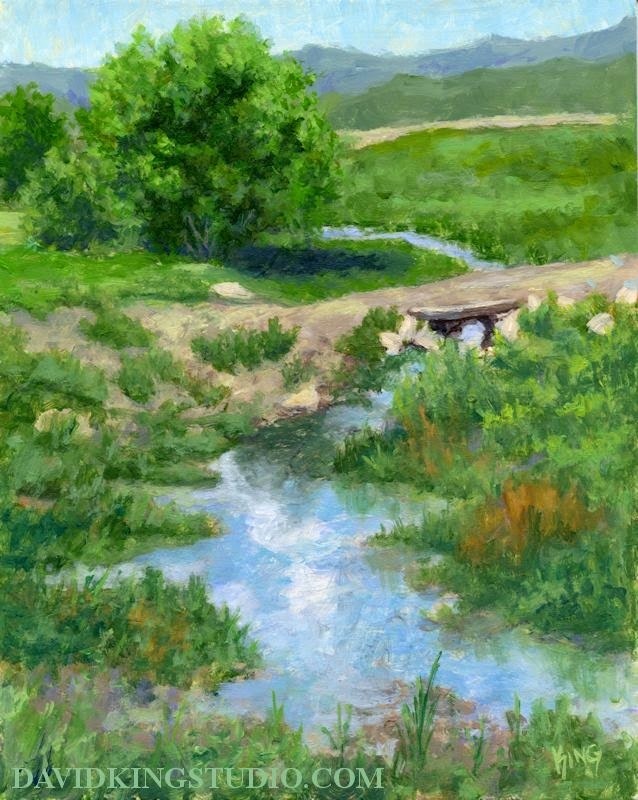 With all the sketching and painting on the Jordan River Parkway I've done this is the first time I've painted the river itself. 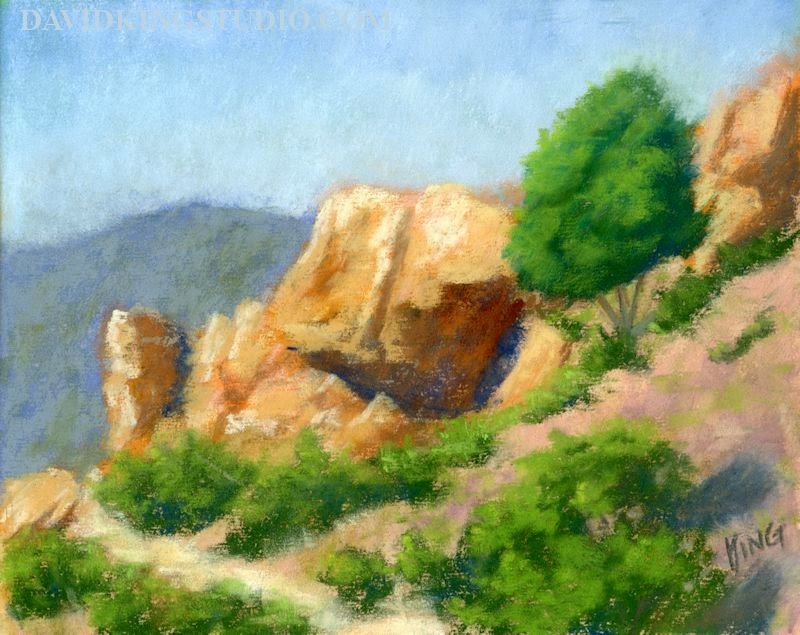 I spent over three hours on this painting which is the most I've ever spent on a plein air painting. That's one advantage to painting at the height of the day, the shadows don't change as when the sun is nearly directly above. Still, I couldn't have painted much longer, by the time I finished up the afternoon was turning into evening and the sun was getting lower and into the west. I went to Wheeler Farm today with my sketching backpack planning on doing a largish, detailed pencil sketch or two. I realized just as I went to unzip my backpack that I had left my pencil case at home, still sitting on my drawing table. Then I remembered I keep a couple pens and a mechanical pencil in my car so I went to retrieve them. 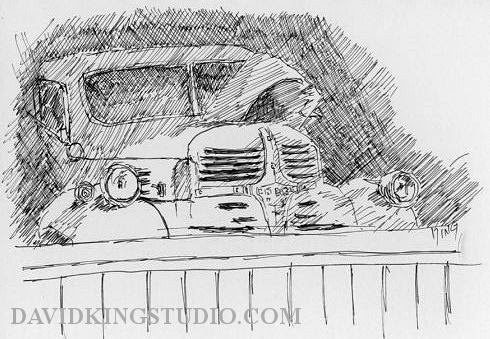 Turns out the lead was jammed in the tip of the mechanical pencil and I had no way to get it out, so I resigned myself to pen sketching. I went to start with the .03 pen and the tip was damaged, no ink would come out. All that was left was the .1 pen, luckily it worked and worked well, unfortunately I can't be very subtle with the larger tip but I made do. 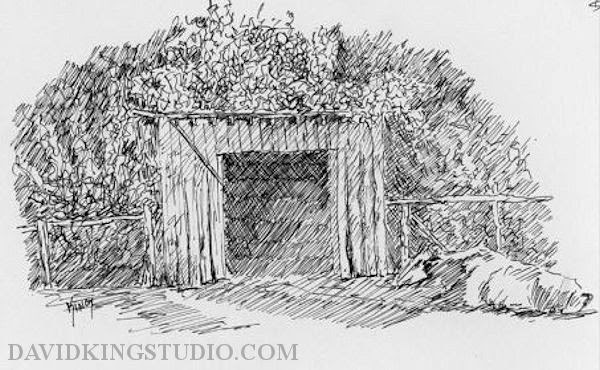 The first sketch was at the west end of the farm, a spot kind of by itself that doesn't get much attention. 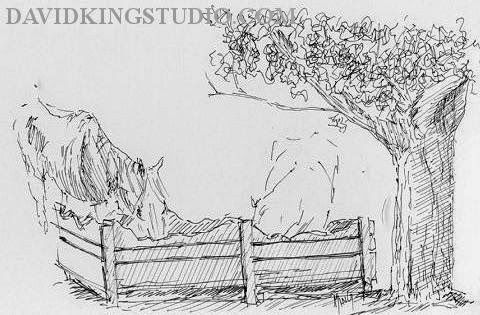 The cow looked content to be lying there so I took advantage and sketched it in first. The thing about the scene that intrigued me most was how the shed was practically being engulfed in foliage, in particular the Russian olive tree that was making its way across the roof. I think this might make a good painting. For the second sketch I got a little more brave and tried to sketch horses eating at the trough. Unfortunately the one on the right left before I good get any shading on him, so he's just a ghosted outline. The tree wasn't actually right there, it was quite a ways farther to the right but since I couldn't finish the horse I figured I might as well put something else in there. Obviously I'm not showing this sketch because I think it's good, it most definitely is not, but it was a useful exercise. I plan on eventually putting animals into my paintings so I figured I ought to get more experience sketching them from life. 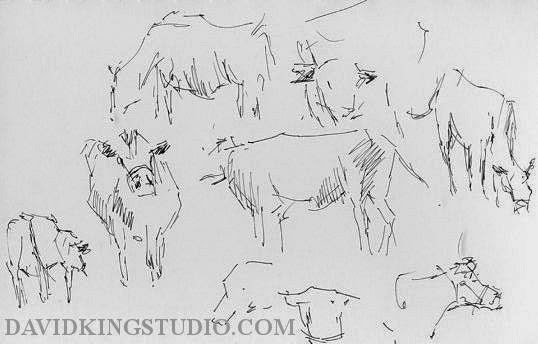 I really admire artists that somehow can make great sketches or even paintings of animals from life, even cows move more than I can handle! This group of cows in particular was feeling playful today, often pushing and bumping into each other. I just tried to fit as many quick gesture sketches on one page in the sketchbook as I could. Now this is more my speed. Wheeler Farm has a 100 year old, restored garage in which they keep an old Dodge truck. Unfortunately much of it is blocked off from view by a partition on the lower half of the garage opening, and the rest has a screen over it. Not much light makes it into there but I decided to sketch what I could. It didn't occur to me that the garage was something they locked up when they shut the place down for the day. Luckily I was close to finishing when one of the employees came over to lock up, he saw that I was drawing though and let me finish first while he went to other buildings to lock up. Thanks, whoever you are! Since I was hiking I didn't take my easel. I just took a regular size backpack with a folding stool, my pastel box, boards and other incidentals. For this painting I sat on a rock and set the pastel box on the stool while I held the board in the pastel box lid, simple and it works. 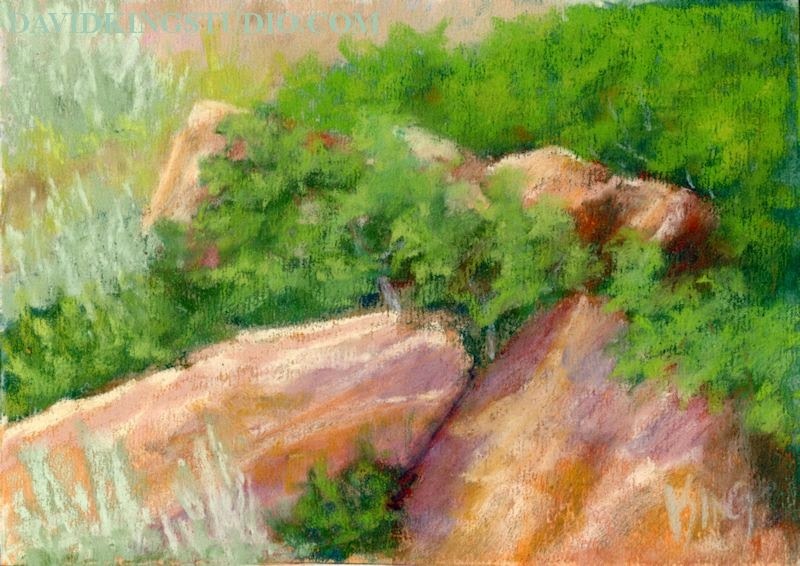 "Red Rock and Scrub Oak"
Who needs expensive, fancy equipment to make a nice, small painting outdoors?